The emphasis is on meeting practical power monitoring needs by providing all the features required by your front-line personnel yet at an attractive cost. The 5515 and 5520 adds full power quality analysis features including harmonic and waveform capture capability, with the 5520 also has load control relay outputs. The fourth voltage and current channels allow neutral-ground voltage and neutral or ground current monitoring. The LM5500 series calculates rms voltage and current values every cycle and saves time-stamped event data if they are out of user specified limits. One cycle swell/sag data is then available for every event. Min rms, max rms and average rms values are stored for every storage interval. Text data on up to 3000 events can be saved. The units record more than 30 power parameters including KW, KVAR, KVA, True and Displacement Power Factors. 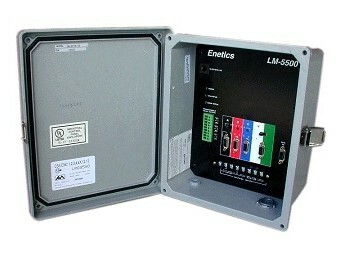 The LM5500 series uses the Enetics SMART CT technology whereby each CT’s calibration data is stored in the connector. This error correction technique achieves a current accuracy of better than 0.3% for CT and recorder combined, and better than 0.5% for power. The CT’s can be moved from channel to channel or unit to unit without sacrificing accuracy. A wide range of CT’s (including self-powered flexible CT) from 20A to 6000A are available. Real time data is available from the RS-232 port to aid in set-up verification. Voltage, current, power, harmonic readings and waveforms are updated every 7 seconds. The LMS5700 software consists of two major components, the database (SQL) and the charting/reporting software. The database automatically aggregates data collected from one or more designated sites. Data is easily retrieved to generate the required charts and reports. For user flexibility and extensibility, charts and reports are generated in Microsoft Excel. The Excel worksheet data file can then be exported in various formats and shared among users. Zooming and panning is available on the charts. A key advantage of using an SQL database and Excel is that it is an “open” system, you are not locked into any suppliers’ proprietary software. You can retrieve any data available from the database and/or use the Excel data to generate additional charts and reports. Software reports storage duration at set-up. Waveform and Event capture storage is independent of interval data storage. Copyright © PEML is a division of Trans-Euro Engineering Services Ltd. All rights reserved.